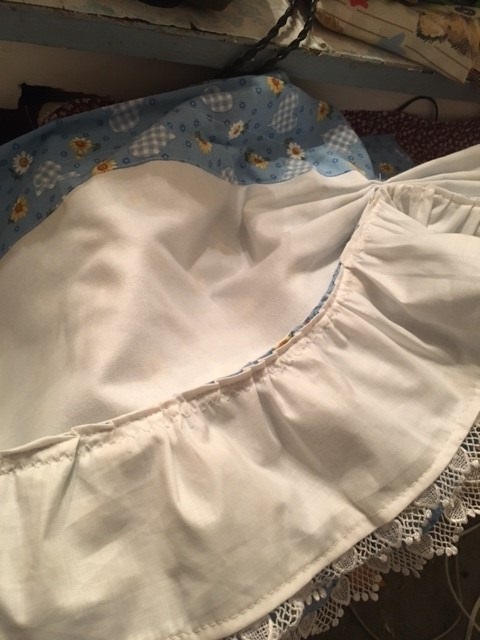 This week I haven't done much but work on my mom's curtains. 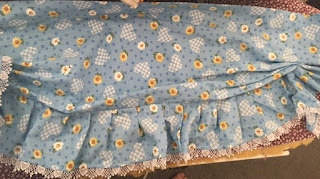 She had a woman recover a bunch of her furniture and make her some valances. 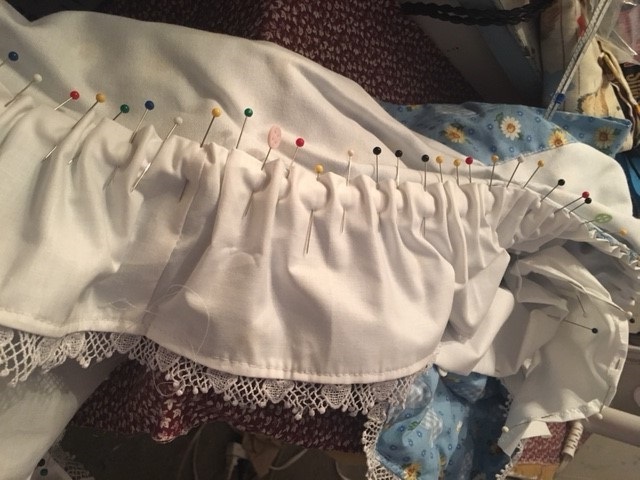 When she got them back she was upset that the woman didn't line the ruffle part and somehow I ended up being voluntold to fix it haha. I told Scott "my mom is going to owe me big for this!" He's like well she did give birth to you. Yeah yeah. 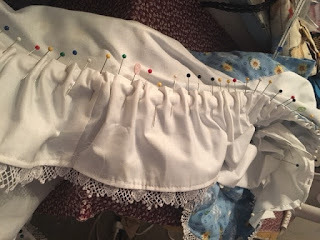 I had put her off on fixing them until "after Easter" so I guess that was this week. It took me 2 nights after work to get them done but wooho they are done now. 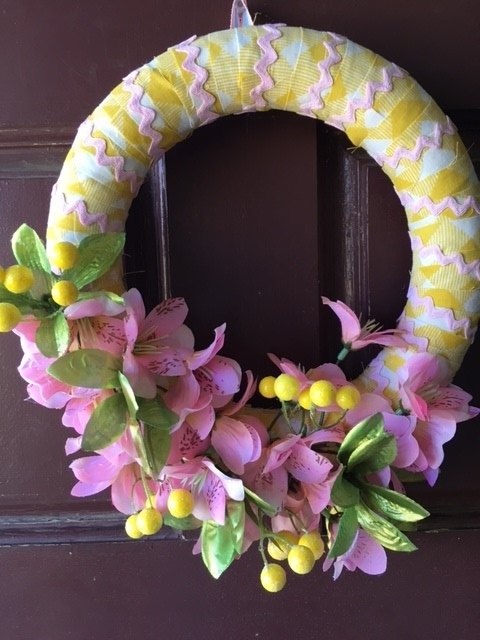 I don't think I shared my little wreath I made when I was procrastinating cleaning before Easter. 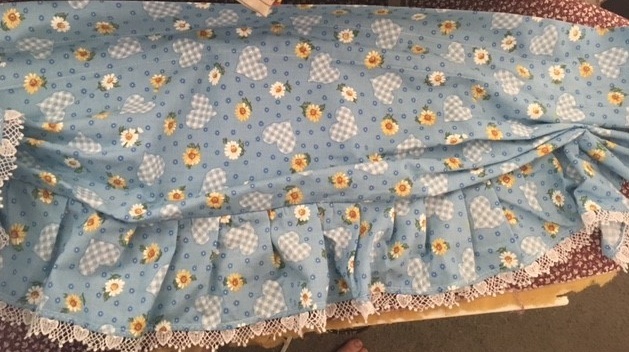 It's just a bit of the leftover fabric from the chair covers I made and some dollar store flowers. I had had this hard foam-like wreath kicking around my room so I used that. I'm pretty sure I had picked that up at the dollar store too. I think it turned out cute for only spending a couple bucks on the flowers. I seem to be into yellow right now. Well not as much as my neighbor though. I noticed she got a new shed yesterday when I left for bingo at like 6:00pm. Some time between then and this morning she painted it yellow. Her house is like a mustard yellow color so I think it kind of matches that. I wonder if she'll paint the other shed to the left. The red building to the right is actually a garage for the next door house. The man that owned that died and his son owns it now. Supposedly someone is buying it from him. I keep hoping they will paint it. A nice color, hopefully lol. I really think you did a FABULOUS job on the wreath. But you do great work on everything you show us. 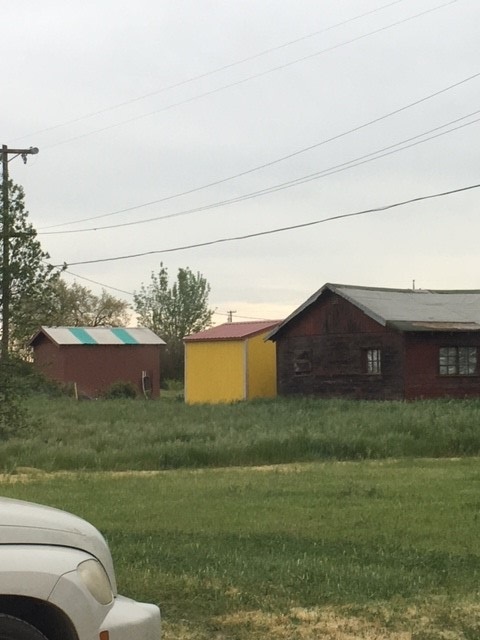 I like yellow a lot but that shed is all kinds of wrong in yellow. Your wreath is awesome and I am also very impressed that you can sew!!! It might sound crazy but that shed color takes me back to Aruba… I would channel the beach spirit every day looking at that - ha ha!! !